Crowning a dramatic achievement for a climate champion, Parliamentary Secretary for Climate Change and Energy Efficiency Mark Dreyfus presented Steve Fieldus with a plaque certifying that his heavy transport fleet is now Carbon Neutral. 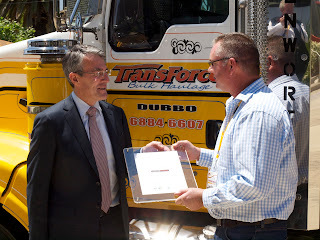 Transforce Bulk Haulage completed the transaction by purchasing 500 tonnes of offsets live online at the Carbon Farming Conference in Dubbo on 23 October, 2012. 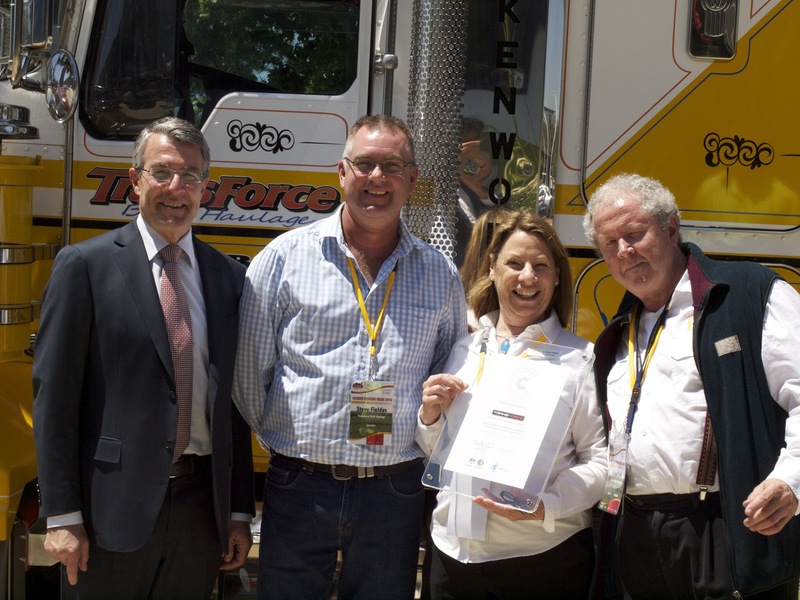 Steve told the audience that his goal was to make his fleet as fuel efficient as possible and to secure the future of his children and grandchildren. Carbon Farmers of Australia - the hosts of the Carbon Farming Conference - mapped the carbon footprint and prepared the submission to Low Carbon Australia (the agency responsible for the National Carbon Offset Standard), and advised on the purchase of offsets to bridge the gap between emissions that can be reduced at present and total emissions. We are thankful for the support from GHD environmental engineers and auditors (for verification services) and Carbon Trade Exchange (for offsets sourcing and acquisition services).